Following their nine-year absence, Hecate Enthroned returned to the scene in 2013 with their ‘Virulent Rapture’ album, an album which garnered mixed reviews from both fans and critics alike. 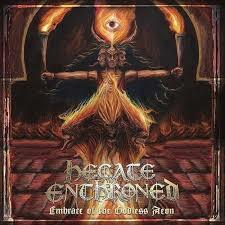 As the tour concluded, Hecate Enthroned parted ways with Elliot Beaver, the vocalist for the ‘Virulent Rapture’ album and in 2015 announced that former Lacrota and Sadistic Undertorture vocalist Joe Stamps would be taking over singing duties with Hecate Enthroned delivering their sixth album ‘Embrace of the Godless Aeon’ after a four year wait. ‘Embrace…’ instantly delivers the goods, as an album it pushes the bands previous effort to the side, almost blatantly ignoring it and ploughs forward to create a bridge with the bands more prevalent work such as ‘Redimus’ and ‘Dark Requiems… and Unsilent Massacre’. Hecate Enthroned have achieved this by bringing their symphonic nature forward once more, making the keyboard soundscapes one of the prominent features which almost leads the black metal wall of sound forward. Furthermore, whilst tracks such as ‘Whispers of the Mountain Ossuary’ contain large elements of melodic death metal that would appeal to fans of Dark Tranquillity or Amorphis; it is the entwining of black metal vocals and soaring female leads which make this album so endearing, appealing to fans of both Cradle of Filth and Dimmu Borgir with excellent tracks like ‘Revelations In Autumn Flame’, the sombre musings of ‘Enthrallment’ and the tour de force which closes the album, ‘Erebus and Terror’. For those looking for that first wave or that classic Norwegian sound, it would be difficult to find here. ‘Embrace…’ is well-produced with excellently crafted songs and although Hecate Enthroned do little here to expand on the accessible formula already laid down by Cradle of Filth and Dimmu Borgir, it does not take away from the overall enjoyable sound which this album presents. Yet, more importantly, it is good to have Hecate Enthroned back doing what they do best and ‘Embrace…’ is a perfect example of what they do best.